Dentures are removable prosthetic devices worn in the mouth to replace missing teeth. There are two types of dentures—complete (full) dentures and partial dentures. 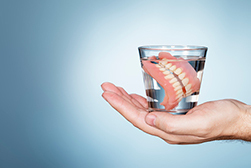 A complete denture is recommended for a patient who needs a denture to replace all of their teeth on either their upper or lower arch (i.e., maxillary or mandibular arch, respectively); the complete denture is supported entirely by the gums. A partial denture is recommended for a patient who needs a removable prosthetic to replace missing teeth on one of their arches and is primarily supported by the natural teeth. Dentures can also be categorized into conventional and immediate dentures. Conventional dentures are made for a patient who has had missing teeth for a long period of time, or after bad teeth are removed (extracted) and the gums have completely healed. Typically, at least two or three months is required for the supporting bone and gums to stabilize after (an) extraction(s) before the process for making a conventional denture can begin. An immediate denture, as the name implies, is a denture the is made for a patient before the bad teeth are extracted. This is done so that the patient does not have to go “without teeth” for any period of time. For every denture that we make for a patient, our goal is the same—to produce a denture with the best function, stability, and esthetics possible. Dentures can play a much bigger role than just chewing food and providing a nice smile for people. They can influence the way you pronounce words; they can provide a natural “stopping” point for your teeth if you don’t have natural teeth to provide that stop; they can even help shape the appearance of your cheekbones. If you have any questions about dentures, give us a call at (918) 488-9770 and Dr. Street and his staff will be happy to help you!